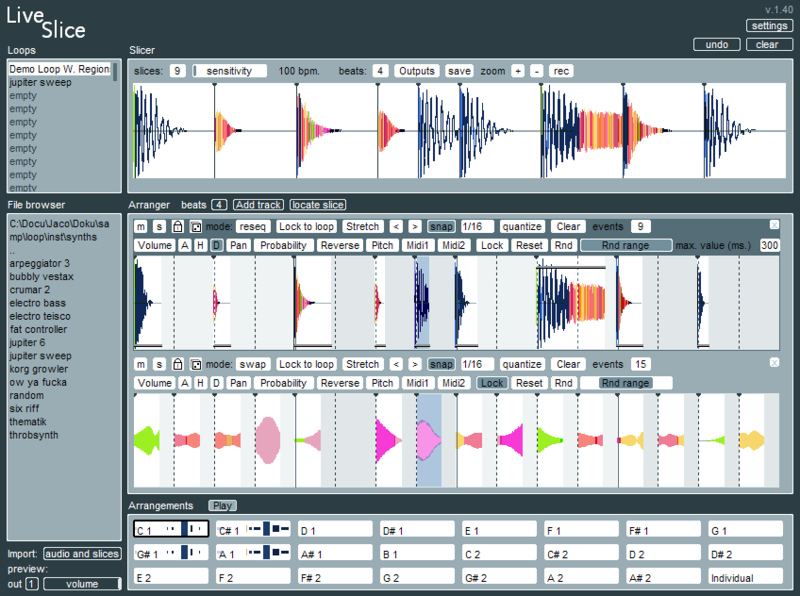 LiveSlice is a beat slicer and arranger intended to be played live - like an instrument. Everything can be controlled by MIDI, fine tuned in the GUI and seamlessly integrated in your midi sequencer - all in one creative workflow. You can now load multiple files at once. Load many one shot samples to the same loop slot. Keyboard shortcuts in the file manager. Added an option to speed up loading of files at the expense of less detailed graphical representation. Updated user interface backend (better performance). Improved scrolling in the file browser and loops list. Fixed minor bug with pasting events. The "clear" command now properly resets all parameters. Fixed clipping during 24 bit export.